Under the modern concept of marketing consumer is considered as King as all business related activities revolve around providing the maximum satisfaction to the consumer. After economic liberalisation, a myriad of consumer goods and services have flooded the Indian markets. As consumers we many times fall prey to tall claims of high quality, unfair trade practices, fancy packaging and many times are unable to make rational judgement. Consumer protection encompasses all aspects of consumer welfare and has been internationally recognized in recent times. This is in tune with consumerism as a social force to aid and protect consumers by legal, moral as well as administrative and economic policy measures. The main thrust of consumerism to-day has widened to include a multitude of group actions concerned with human values and environmental considerations besides issues such as consumer protection laws, availability of product and price information, checking fraudulent and deceptive business practices and product safety. Today consumers want value for money, a product or service that would meet reasonable expectations, should be safe in use and full disclosure of the product specification. 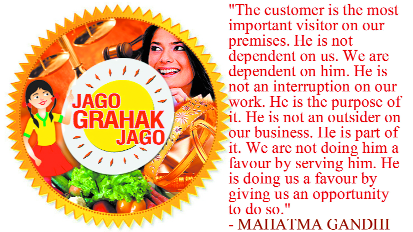 These expectations are termed as ‘Consumer Rights’. 15 March is observed as the World Consumers’ Day in different parts of the World. This day has been inspired by John F. Kennedy and on this day in 1962, the Bill for Consumer Rights was moved in the US Congress. During his speech President John F. Kennedy had remarked: “If a consumer is offered inferior products, if prices are exorbitant, if drugs are unsafe or worthless, if the consumer is unable to choose on an informed basis, then his dollar is wasted, his health and safety may be threatened, and national interest suffers.” John F. Kennedy had equated the rights of the ordinary American consumer with national interest. He gave the American consumer four basic rights such as, right to safety, right to choose, right to information, right to be heard. Kennedy recognised that consumers are the largest economic group in the country’s economy, affecting and affected by almost every public and private economic decision. But they were also the only important group who were not effectively organised, whose views were not heard. These were the political circumstance in USA when the US economy was growing after the second world war and the middle class was expanding. As consumers faced exploitation by business, Kennedy the politician used consumer rights as a political opportunity during his election campaign. He received support from the American public. When he was elected as US President he took a series of steps to ensure the implementation of consumer rights. Therefore, the US Federal Government, by nature the highest spokesman for all people, had a special obligation to the consumer’s needs. Thirteen years later President Gerald Ford felt that the four rights constituted in Kennedy’s Bill of Rights were inadequate for a situation where most consumers are not educated enough to make the right choices. So he added the Right to Consumer Education to these rights. An informed consumer cannot be exploited easily. This charter has a universal significance as they symbolised the aspirations of the poor and disadvantaged. On this basis, the United Nations, in April 1985, adopted its Guidelines for Consumer Protection. This year the theme for World Consumer Rights Day 2017 as proposed by Consumers International is ‘Building a Digital World Consumers can Trust’. With the rapid development of digital technologies and the increasing usage of e-commerce, smart phones, cloud and internet there is a change in the business paradigm. Business processes are transforming rapidly and Internet technology, mainly the World Wide Web (www) as an electronic medium of exchange has given rise to a de-territorial virtual market place. The new age consumer often engages with a remote but interactive marketplace characterized by high levels of heterogeneity and therefore needs to be digitally enabled. In the business-to-consumer segment, sales through the web have been increasing manifold over the last few years. The number of consumers who use the Internet not just for searching information but also for purchasing goods and availing services is growing. Innovative product and service delivery systems like Direct Selling, Multi-Level Marketing and e-commerce do sometimes pose problems typical of cross-border transactions in both goods and services; risks of poor quality and unsafe products; heas well as predatory, exploitative and unfair trade practices. These pose new challenges to creating awareness among consumers to prevent consumer detriment besides rendering the grievance redress process impersonal and the dispute resolution process complex, time consuming and expensive. A key milestone in consumer advocacy in the country was the enactment of Consumer Protection Act, 1986. This Act provides a legislative framework for better protection of the interests of the consumer by creating a formal but quasi-judicial dispute resolution mechanism exclusively for consumers. This progressive legislation establishes a three-tier quasi-judicial consumer dispute redress machinery at the National, State and District levels aimed at providing simple, speedy and affordable redress to consumers. As on date 644 District fora, 35 State Commissions and the National Commission at the apex level are functioning in the country. a) The Act enshrines six rights of consumers namely, Right to Safety; Right to be informed; Right to choose; Right to be heard; Right to seek redress & Right to consumer education. b) The provisions of the Act are in addition to and not in derogation of the provisions of any other law for the time being in force. c) It is an umbrella legislation covering goods & services, but excluding transactions not involving consumers from the purview of the Act. d) A consumer can seek redress against any manufacturer and trader of goods/service provider, so long as the goods purchased or service availed of was for a consideration. The Act provides for simple, inexpensive and timely redress of consumer complaints. f) The provisions of the Act are not only compensatory in nature but also preventive and punitive in character. g) The Act also provides for setting up of Consumer Protection Councils at the Central, State, District level, which are advisory bodies to promote and protect the rights of the consumers. 1. Right to Safety: It refers to the right of a consumer to be protected against hazardous effects of all possible consumption patterns and to all goods and services which may affect life and property. In the context of the globalization of markets, where consumers have access to imported goods easily, the right to safety has become a pre-requisite for quality, standards in all products and services. According to CI the right to safety means, “the right to be protected against products, production processes and services which are hazardous to health or life”. We hear many accidents which are caused by the result of faulty electrical appliances, adulterated food, poor sanitary facilities, substandard building material, etc. Earlier, the interpretation of the right to safety was limited to electrical products and other such products. The Consumer Protection Act mentions right to safety as the first and foremost consumer right. BIS runs its ISI scheme for certification and conformity assessment where the quality of products are being tested against national standards. Consumers should check the quality marks such as ISI, FSSAI, BEE before purchasing products. e)Generates consumer pressure on producers to increase the quality of their products. f)Raises standards of these products by increasing public awareness. 3. Right to Choose: The right to choose means the right to be assured wherever possible, access to a variety of goods and services at competitive prices. Fair competition should be encouraged in order to provide consumers with the greatest number of choices at lowest cost. The manufacturer should make sure adequate availability of reliable after-sales service and spare parts. The right to choose is based on the concept of consumer satisfaction. The consumers should be protected from such contractual abuses as one sided contracts, exclusion of essential right in contract, and unconscionable conditions of credit by sellers. This right in case of developed countries where there is situation of plenty means more variety of products and services to choose from. The right to choice has a very different definition in developing countries. For a population dependent on the environment for livelihood, the right to choice and other consumer rights need a shift in focus. The focus needs to be on choice of good practices like organic farming and conservation of natural heritage. In cities, people should be able to choose cleaner and safer ways of transportation over polluting ones. Similarly, healthy and fresh food should be chosen over junk food. 4. Right to be Heard: The right to be heard is one of the first principles of natural justice. The right to be heard means that consumers should be allowed to voice their opinions and grievances at appropriate forums. For e.g. if you have been cheated in the market place or deprived of the right quality of service, your complaint should be heard and given due attention by the business firms concerned. In case of big businesses there should be consumer grievance cells and customer care centres who should try to solve consumer problems. Consumers should also have a right to voice their opinion when rules and regulations pertaining to them are being formulated such as the various amendments in the rules and regulations affecting consumers. 5. Right to Seek Redressal : Means right to seek redressal against unfair trade practices or unscrupulous exploitation of consumers. It also includes right to fair settlement of the genuine grievances of the consumer. Consumers must make complaint for their genuine grievances. Many a times their complaint is of small value but its impact on the society as a whole is very large. In India, we have a redressal machinery called Consumer Forums constituted under the Consumer Protection Act (1986), functioning at national, state and district levels. But it has not been made complete use due to lack of awareness of basic consumer rights among consumers themselves. Con-sumers can also take help of consumer organisations in seeking redressal of their grievances. 6. Right to Consumer Education : Means the right to acquire the knowledge and skill to be an informed consumer throughout life. Ignorance of consumers, particularly of rural consumers, is mainly responsible for their exploitation. They should know their rights and must exercise them. Only then real consumer protection can be achieved with success. Strengthening of CPA : An important step initiated by the government has been to modernise the legislative framework that governs consumer affairs. The Department of Consumer Affairs has proposed comprehensive amendments to the Consumer Protection Act and has introduced the Consumer Protection Bill, 2015 in Lok Sabha on 10.08.2015. The same has been referred by the House to the Standing Committee on Food, Consumer Affairs and Public Distribution for examination and report. *Establishing an authority called the Central Consumer Protection Authority to investigate unfair trade practices; initiate class action in appropriate cases; order refund, recall or replacement of defective products; and the withdrawal of misleading advertisements and carrying out of corrective/ compensatory advertisements. *Introducing product liability to enable consumers to sue for damages for injury caused by defective products/ deficient services. *Enhancing the pecuniary jurisdiction of the District Forum, State Commission and National Commission to Rs.50.00 lakhs, Rs.10.00 crores and above Rs.10.00 crore respectively to provide greater access to citizens. *Enabling e-filing of cases and not requiring personal appearance till the stage of admission. Cases not admitted within 21 days will be deemed admitted. *Enabling consumers to file cases in the District Forum with jurisdiction over his place of residence, rather than the place where the transaction was conducted, to provide for ease of access. Information Technology Act, 2000 has given tremendous recognition to online purchases. Reserve Bank of India by issuing various circulars regarding online banking and money transfer activities have made consumers capable of securing the online space. Section 10A of the Information Technology Act, 2000 (“IT Act”) provides validity to e-contracts. The Hon’ble Supreme Court of India in Trimex International FZE Limited Dubai Vs. Vedanta Aluminum Limited 2010(1)SC574 recognized the validity of online transactions and held that emails exchanged between the parties regarding mutual obligations constitute a contract. Section 65 of the Act deals with tampering with computer source documents, Section 66-consists of Computer related offences, Section 66A- involves punishment for sending offensive messages through communication service, etc. Section 66B involves punishment for dishonestly receiving stolen computer resource or communication device. Section 66C-deals with punishment for identity theft and Section 66D mentions punishment for cheating by personation by using computer resource. Section 66E gives punishment for violation of privacy without the consent of the person. The punishment for the offender may extend to three years or a fine which may extend to one lakh or both. Thus, a high level of consumer awareness and protection in every strata of the society is required so that consumers both at individual or collective level are empowered to exercise their rights and responsibilities consciously.